While I love to talk about my fitness journey here on my blog and on my social media, I’ve never actually had the chance to talk about it in person let alone to an audience that isn’t family or friends. Tomorrow, I will do exactly this. 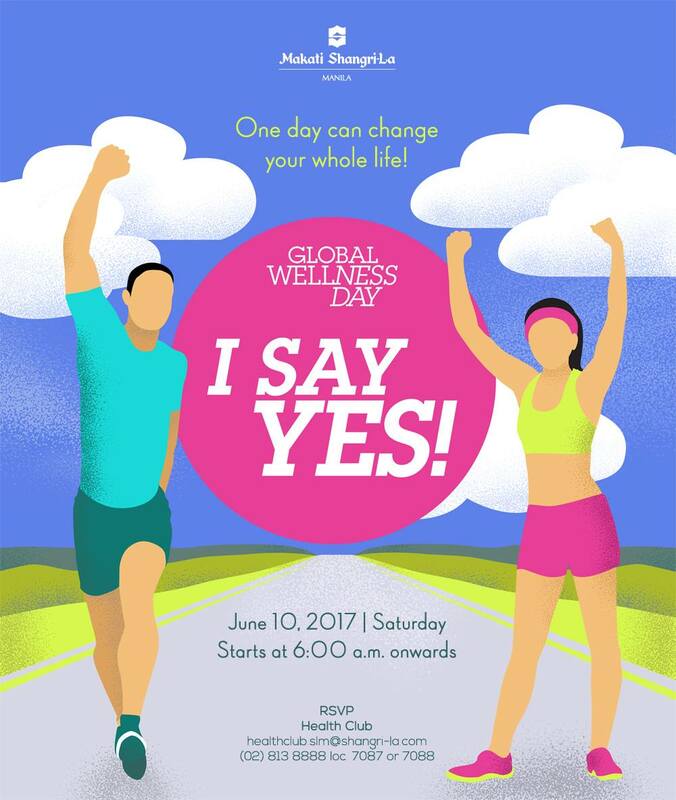 In celebration of #GlobalWellnessDay, Makati Shangri-La is having a one day event that offers fun fitness and wellness activities open for everyone. Best part? It’s free! If you’re interested to attend, simply email or call the number above. I’ll be doing my talk at 4 PM. 🙂 Part of my talk will be a Q&A slash sharing portion where you can ask questions and also share your fitness stories with everyone. Let’s all share & encourage each other to live an active lifestyle. I can confidently say the past few months I am my fittest. I eat well, (and by well I mean balanced meals with cheat meals on weekends. heehee) I train smart, and I try to sleep well. When you try to do well daily–usually in all aspects of your life–it’s more easier to achieve a balanced life. Now I know it can really be challenging to balance especially if you’re a mom. There will always be days that are too full that you can’t even accomplish simple chores or errands. I know because I experience it. So how can a busy mom incorporate fitness in her daily life? This is what my talk is all about. The Secret Diaries of a Fit Mom–this is the title of my talk tomorrow. Heehee. I don’t know if it’s really a secret but my talk will let you in on my fitness journey–how I started and tips on how you can create your own fitness regimen. Basically for beginners who want to know where to start or at very least want to know how and why I started.